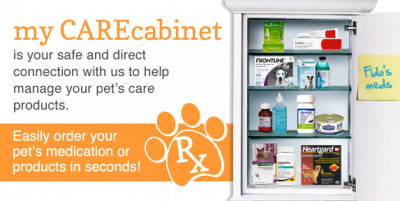 If you would like to have our online pharmacy save the info about each of your pet's medications, remind you when it's time to refill, or set up auto ship, just click on the medicine cabinet and you'll be taken to the CAREcabinet login. The first time you go there, it will walk you through creating your account. To insure the safety of your medical and financial information, the medical records and pharmacy sections of the website have seperate logins. Your user name for both should be the email address you've given us. You can choose to use the same password for both.